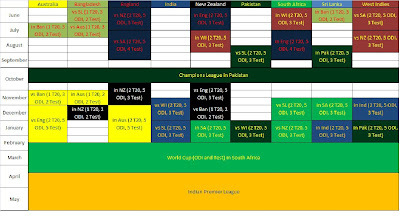 1.9 test-playing nations play each other in home and away series (T20, ODI, Test) over a period of 4 years. 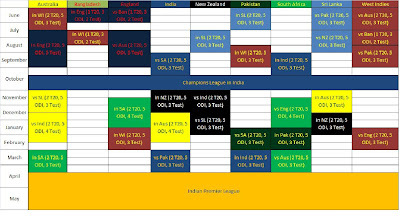 2.There are separate windows for IPL and Champions League so that players don't have to choose between their national side and their club. However, players have to be available for selection for atleast 75 percent of the bilateral matches their national side is part of. 3.There will be two Twenty20 World Cups (2016 and 2018) and one Champions Trophy (2017). 4.Every country apart from Bangladesh gets to host a major tournament. 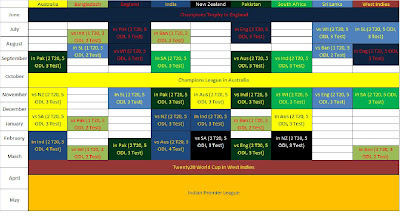 5.The FTP will culminate with the Final Four of the World Test Championship and the ODI World Cup. The Final Four will be decided based on the points per test (Total points earned divided by number of tests played). 6.Every board contributes a percentage of its total revenue into a pool. The total money is then equally distributed among the national boards. The revenue from IPL and Champions League need not be shared. 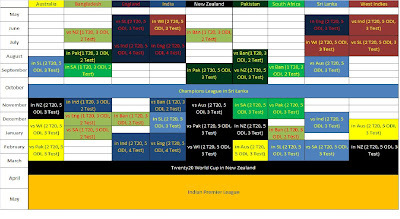 wow loving it, didn't went into details yet but overlooking at it is just looking something sensible specially like the division of mega events in every country, specially Champions League I am also a strong believer that it should happen in every participating country every other year on turn. The amount of free time some people have is just amazing.